To help promote Coca-Cola Zero Sugar in the lead-up to Christmas, Coke’s Western European team wanted to excite their retail and exhibitor customers and engage consumers with a stand-out campaign. Coca-Cola has been intrinsically linked with the cinema-going experience throughout their history. What better way to celebrate this, and spark genuine excitement, than to partner one of the biggest and most loved FMCG brands with one of the biggest and most loved entertainment franchises of all time? 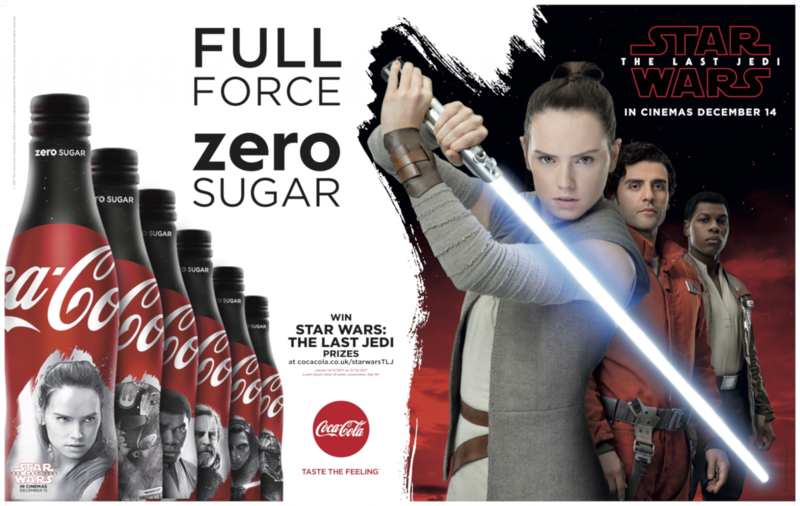 We helped Coca-Cola activate their Coca-Cola Zero Sugar X Star Wars: The Last Jedi partnership across Europe, developing limited edition aluminum bottle, sleek and mini can designs for consumers to collect. The six exclusive designs included Rey, Poe, Finn, Luke, Captain Phasma and Kylo Ren. This huge team effort also saw us develop a market toolkit and point of sale with a campaign line ‘Full Force Zero Sugar’, while collaborating with Coke’s advertising and social agencies to develop a cinema ad and social campaigns. This is now recognized as a success story for Coca-Cola and is a benchmark for future activity. The collectible aluminum bottles were highly desirable and sold out overnight.